Before constructing small Earth models of the Earth, surface areas of the seafloor crustal stripes must be measured in order to then back calculate an ancient radius for each coloured stripe. By using these radius measurements, globes can then be created at pre-determined radii ready for cutting and pasting the crustal mapping information on. Once ancient Earth surface areas are measured and radii calculated, small Earth model construction is carried out in two main phases. This model construction uses theGeological Map of the World plotted in 24-segment sinusoidal projection, as shown below. This projection format is true-to-scale and allows the map segments to be cut and pasted directly onto a sphere. 24-segment sinusoidal map projection of the Geological Map of the World. This projection enables the geological map to be displayed in distortion-free spherical format and forms the primary base-map for both surface area measurement and small Earth model constructions. The first model construction phase coincides with the past 200-250 million year time interval, extending from the present-day back to the early-Triassic Period. This phase uses relatively well age-dated seafloor mapping to constrain assemblage of seafloor crustal plates on each small Earth model and covers the closure of each of the modern oceans to assemble as the Pangaea supercontinent. 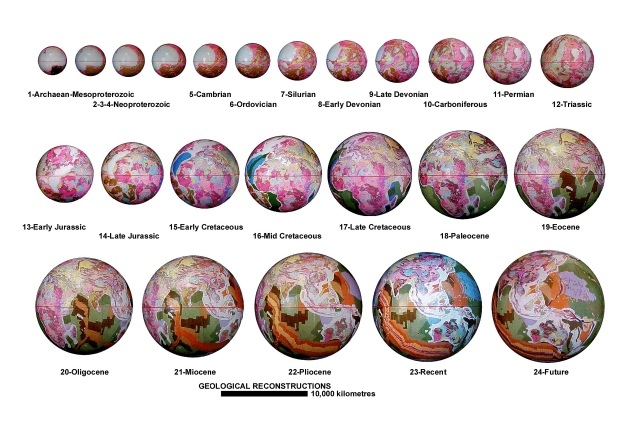 First phase spherical small Earth models of the Jurassic to present-day Expansion Tectonic Earth. 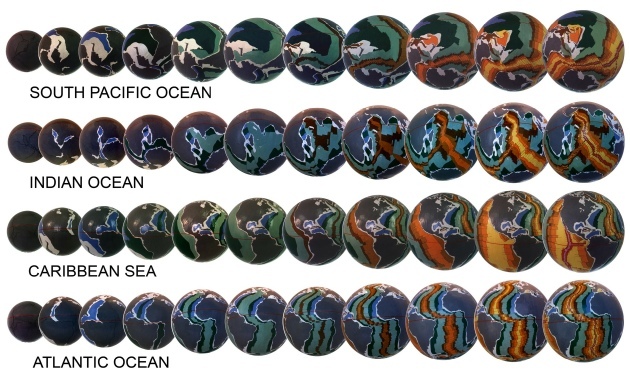 Each small Earth model demonstrates that the seafloor crustal plate assemblage coincides fully with seafloor spreading and geological data and accords with the derived ancient Earth radii. The second construction phase is more difficult to achieve and uses an identified network of continental sedimentary basins to then model the continental crusts back to the early-Archaean times–around 4,000 million years ago. This second phase passes back in time through each of the known supercontinental stages to ultimately assemble back to a unique primordial Earth assemblage. Second phase Archaean to future Expansion Tectonic small Earth models. Models show relative increase in Earth radii over time showing both continental and seafloor geology. Models range in age from the Archaean through to the present-day, plus one model projected 5 million years into the future. The outcome of this modelling exercise demonstrates that, for each of the established crustal plates, there is only one unique plate-fit-option for the models shown. From this, it can be seen that there is no need to introduce pre-existing crusts or to randomly fragment continental crusts in order to accommodate for seafloor or continental crustal evidence.